You’ve probably heard the advice to “invest passively” and “seek funds with lower fees”. But… do you have any idea how much of a difference it makes in terms of money over a career of saving? Today’s we’re going to weigh in and take sides in the active vs. passive funds debate. Read on! John Bogle, famous passive investment advocate and the founder of Vanguard, is a huge fan of passive investing (hence the ‘advocate’ description, and the whole “founded Vanguard” thing). In a paper of his from 2010, he mentioned that the average large cap actively managed fund (citing William Sharpe) charged about a 1.12% management fee, and had an effective 2.27% expense ratio due to the drag of cash held in the fund. The passive fund he put up for comparison was the Vanguard Total Stock Market Fund – now 0.05% management fees, but at the time 0.06% – with all else being equal, that means the active manager would be losing by about 2.21% a year by default. That’s quite a gap to overcome… and certainly not something a lot of managers can do consistently. The Biggest Drain in Your Portfolio? Eduardo Porter at the New York Times wrote a piece about this drain on investor portfolios. He noted that the typical investor in the 55-64 year old bracket has a mere $104,000 saved for retirement (this is our specialty – see our net worth by age calculator here). We’ve all heard the arguments to get people to save more – but, Noah Smith of Noahpinion site has an interesting question – what if the amount of saving people are doing is a rational choice – that is, investors are already optimally smoothing their consumption today? Here in finance and personal finance world, we like to concentrate on saving and earning more – but what is the effect of maximizing the efficiency of what people are already saving? If it’s the case that people are saving what they think they should and it is also true that people aren’t choosing the more expensive active managers for some reason (let’s assume that people will continue to invest in passive funds at the expense of active, as the trend has gone lately), what sort of returns are investors missing out on by picking the more expensive funds? Since it’s true that many active funds become closet indexes, let’s use that as a worst case scenario – funds which match the S&P 500’s performance, except one has 0.06% fees, and we’ll do two more with 1.12% and 2.27% fees. So, let’s take that $104,000 number at face value and create a hypothetical 60 year old investor who has been investing for 35 years. At 2.27% in effective fees, he has to invest $33 a month in February 1980 (increasing the amount monthly for inflation – about $100 in February 2015) to hit $104,111.70. I can tell you our investor invested $28,324.58 total, and returned about 7.43% a year. Remember: Same Amount Invested Monthly in Active vs. Passive Funds! If you’re in an actively managed fund which you don’t have a lot of confidence can beat a broad index? Well, if these assumptions fit your investment life you’d be 87.7% better off over 35 years just going with the cheap index fund. Don’t Save More, Save Smarter! Okay, it’s a silly quote (and on this site, we suggest you save more as well) – but it’s definitely true that a lot of investors would be better off just investing in a passive fund and burying their collective heads in the sand. Some active managers will outperform the S&P 500 – but after fees, not very many will. Other managers are no better than closet index funds, and track indexes close enough that you might as well sell and just buy the index. Anyway, that’s the math – if you find yourself in one of those effective closet index funds, you should switch to a passive fund. You won’t have as much drag due to cash, and it’s so easy a TI-83 can run the fund (if that’s the case then hey, that’s probably cheaper than 0.06%, even!). 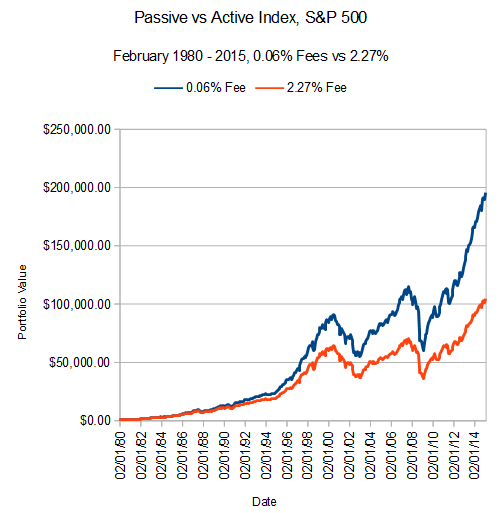 Are you mainly invested in active or passive funds? Newbie stock question: Would you consider placing one’s entire equity holding in a passive index like VTI to be a diversified approach? Thanks. Great post by the way.